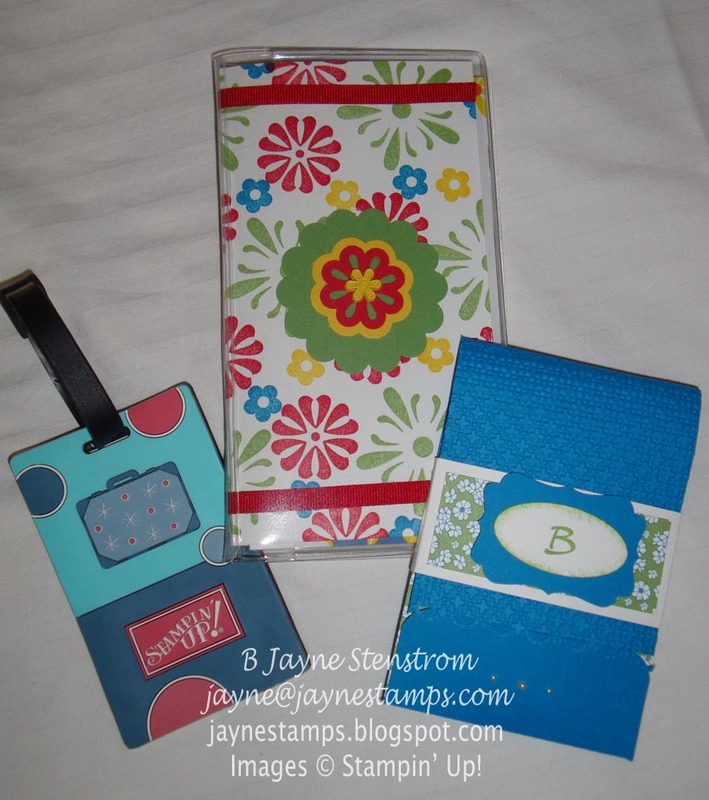 ~ ~ ~Jayne Stamps ~ ~ ~: Roommate gifts that I received at Convention! So the other day I showed you the gifts I gave my roommates at Convention and now I'm going to show you what they gave me (well, everyone in the room). Someone told me years ago that if you expect to come back from Convention with lighter luggage than when you went, it's not going to happen. They were so right! So I made sure this year that I could have TWO checked bags on my plane. First I have Diane's gift to show you. She made this adorable little album using the Square Scallop Die. The DSP that she used is retired, but this is one of my all-time favorite DSP sets, so I forgave her. She also made a scissors charm for each of us. 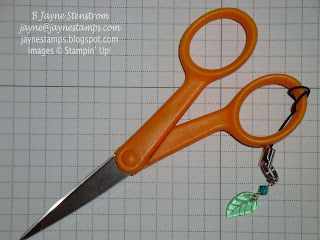 Here's a close-up of the scissors charm. (By the way, why is it called a "pair of scissors" when there's really only one?) 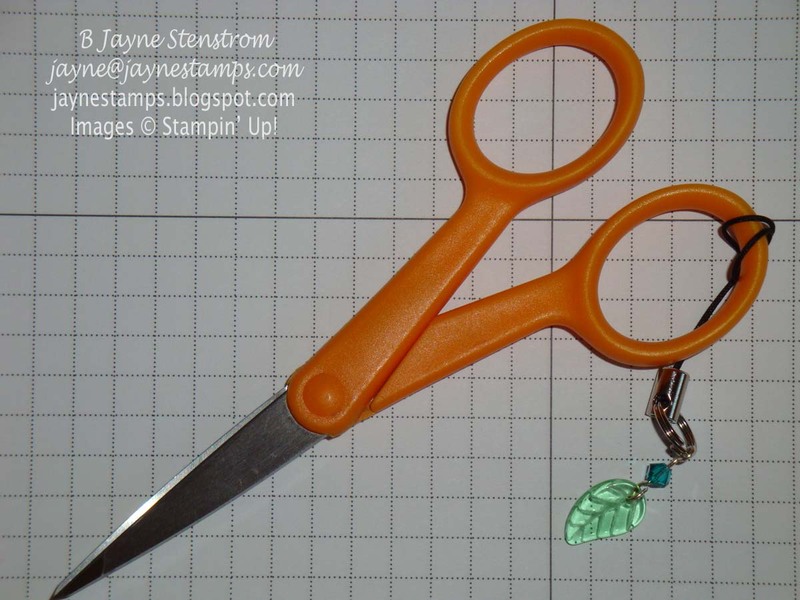 And yes, they're on my contraband scissors. I use my good Stampin' Up! ones for my workshops and classes. 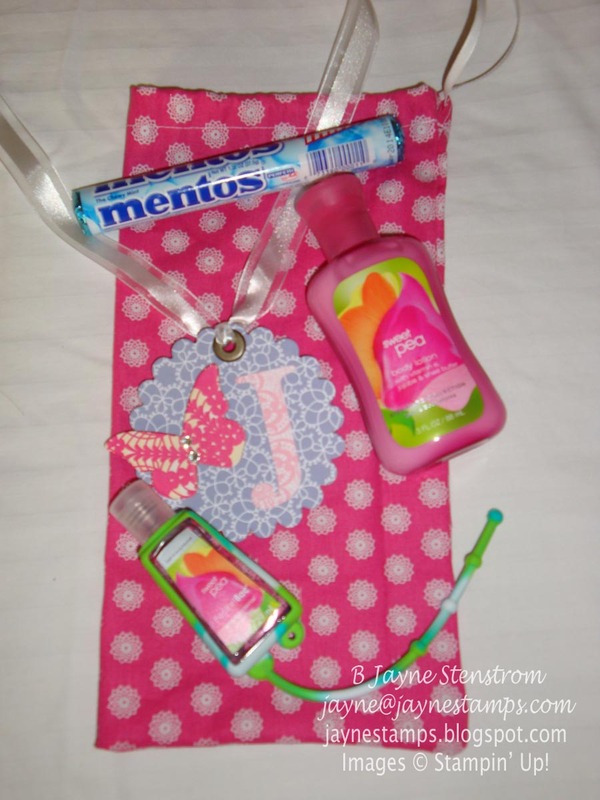 Sara SEWED this adorable little bag and filled it with goodies. This is especially impressive because as far as I know, this is the first thing Sara has ever sewn! 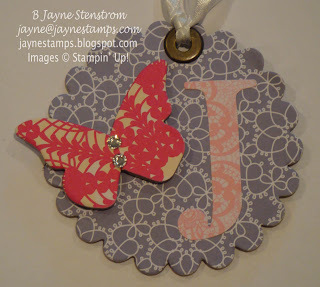 She used some of Stampin' Up! 's Designer Fabric - this is from the Flirtatious group. You can see the fabric on page 196 of the new Idea Book & Catalog. She made a bag tag for each of us too and she used the Flirtatious Specialty Designer Series Paper (pg. 183 of the new IB&C). The actual tag is chipboard covered with the DSP and then run through the Big Shot with the Scallop Circle die. The butterfly is the same using the Beautiful Butterflies die, and the letter is from the Serif Essentials Alphabet die set. Here is what I got from Judy. 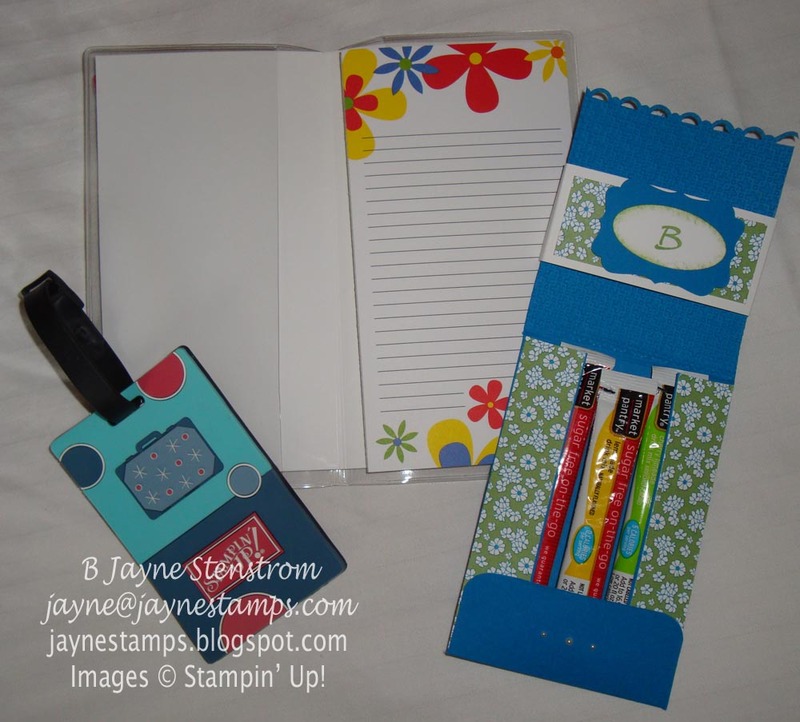 On the left is a suitcase tag from Stampin' Up!, in the center is a cute notepad holder, and on the right is a holder with individual powdered drink mixes in it. I got the one with the "B" on it because my first name starts with B. I go by my middle name - Jayne. Don't blame me, my parents started it! 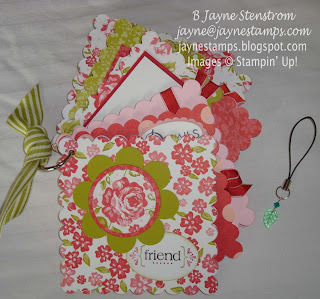 Here is the inside of the things Judy stamped. I love that pad of paper - and Judy stamped the outside to coordinate with it. Too cute! Now again, don't you wish you had been part of our group? Besides receiving these adorable gifts, we ALWAYS have a lot of fun - whether we're at Convention or just getting together to stamp. I'd love for you to be part of our group and join in on the fun! Contact me if you'd like more information.